Did you know that our National Parks are open year-round? Did you know that there are certain days during the year when admission is Free? Did you know that one of the best ways to enjoy a National Park is by renting a timeshare? It's the perfect way to have lots of time and lots of space - to relax and really become immersed in the beauty and wonder of our National Parks. The next free admission day to the National Parks is November 11 - Veteran's Day. And what better time to head to a National Park than during the Autumn, when so many of them are decked out in their Fall Foliage Finest. If you think our "Wildflower National Park," aka Great Smoky Mountains National Park (see photo), is spectacular in springtime - wait until you see it in the Autumn! Undulating ridges of flashy crimsons and oranges as far as the eye can see. 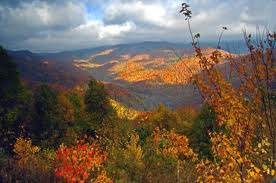 Rent a timeshare in Gatlinburg, TN, the "gateway" to this National Park. From a Washington, D.C. area timeshare rental you can easily drive to Shenandoah National Park where the Skyline Drive winds along the Shenandoah River. You'll delight in the many waterfalls that sparkle like diamonds in the autumn sun, against the rich colors of fall that only the east can deliver. Fall colors are no less beautiful out west, though. Rent a timeshare in Jackson, Wyoming, and check out the shimmering golds of aspen stands in Teton National Park. The dazzling white of geysers shooting into the air against the backdrop of a brilliant blue autumn sky is a thrill at Yellowstone National Park with a timeshare rental in West Yellowstone. Of course, not all Parks have to be seen just for autumn colors. Rent a timeshare at the Wyndham Pagosa Resort in Pagosa Springs, CO, and take a short drive to Mesa Verde National Park. Here you'll see the incredibly well-preserved cliff dwellings of the ancient Anazazi Indians. In soft autumn air you can climb ladders to high lofts or down into sacred kivas. A Hawaii timeshare rental on the Big Island will put you in good position on November 11 for free admission to Hawaii Volcanoes National Park. Get up close and personal with some of nature's most awesome power. You can even hike to a point along the shore where molten hot lava meets cold sea water with some very dramatic crashing and boiling. Wherever you chose your timeshare rental, enjoy our rich heritage of National Parks this November. They are resplendent in autumn dress and exciting with unique natural and archeological wonders.